Euphorbia virosa has a short twisted main stem with large branches emerging from it. The stems are 4- or 5-angled with a pair of thorns at the edges. It has a highly poisonous milky sap which can cause blindness. 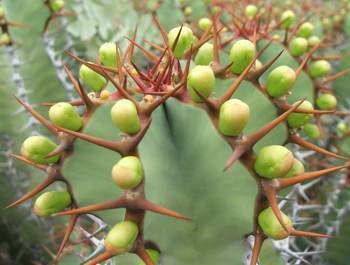 It is known as the most poisonous of all euphorbias. Euphorbia virosa is a tough succulent which usually grows up to 3 m with the main stem partly buried under the ground. The main stem gives rise to large branches 50-60 mm thick and over a metre in height. The main stem and branches are angled and have pairs of thorns at the edges. At first the thorns are dark red and shiny and then become grey. It produces yellow flowers at the tip of the stems followed by red fruits in late winter. 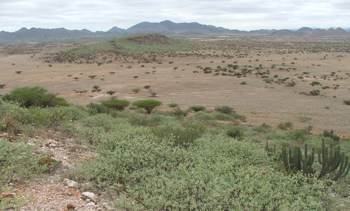 Euphorbia virosa is not an endangered species mainly due to its abundance and wide distribution range in various regions of arid southern Africa. 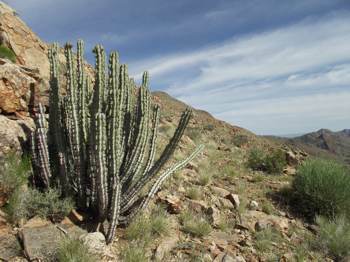 Euphorbia virosa is widely distributed from the northwestern interior of the Cape Province of South Africa to Namibia and all the way to southern Angola. It prefers the very dry and hot areas of southern Africa and is drought-tolerant. It is commonly found in sandy and stony regions associated with rugged hills and mountains. 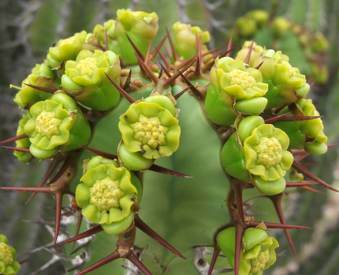 The genus name Euphorbia was named after Euphorbus who was a 1 st century physician to king Juba of Mauritania. It is believed that he used plants of this genus for medicinal purposes. Virosa is the Latin word for poisonous. Euphorbia virosa produces yellow flowers in late winter and is pollinated by bees and ants. It produces fair amounts of nectar, and the surface of the glands surrounding the flowers gathers it for the formation of honey. An irritant is transferred to the honey during its formation by the bees which make it unsuitable for human consumption. The honey can cause a hot burning sensation in the mouth and throat when eaten. The San people of Namaqualand used the milky sap, which is also highly toxic to humans, as an arrow poison for hunting. The sap is a skin irritant which has led to hunters abandoning the use of it. The only animal that consumes the plant is the black rhino. Euphorbia virosa can be propagated from seeds and also from cuttings. Seed must be collected when the seed capsules are ripe but before they are quite dry, because they then burst explosively scattering the seeds far away from the plant. The capsules should be placed in a paper bag once collected and placed in a dry warm area to dry out. Once the seeds are all released from the capsules they should be sown into a tray with a sandy, well-drained medium. The seeds will most likely germinate after 14 days in temperatures ranging from approximately 18-22°C. Protective gloves and goggles should be worn during seed collection to prevent contact with the sharp thorns but especially to prevent possible blindness and skin cancer caused by the milky sap. The species can also be propagated from cuttings. Here again, extreme caution must be exercised and goggles and gloves must be worn. The surface of the cutting wound should be left to dry out for at least 2 to 3 weeks before planting. The cuttings should be planted in a well-drained rooting medium and placed in a well-ventilated environment. Overwatering should be avoided, as this may cause stem rot. Court, D. 1981. Succulent flora of Southern Africa . Balkema, Cape Town. The Euphorbia Journal 1. 1983. Strawberry Press, Mill Valley, California. The Euphorbia Journal 2. 1984. Strawberry Press, Mill Valley, Californa. Jackson, W.P.U. 1990. Origins and meanings of Southern African plant genera. University of Cape Town Printing Department. Nichols, G. 2005. Growing rare plants: a practical handbook on propagating the threatened plants of southern African. 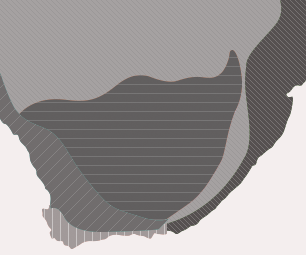 Southern African Botanical Diversity Network Report No. 36. SABONET, Pretoria. Raimondo, D., Von Staden, L., Foden, W., Victor, J.E., Helme, N.A., Turner, R.C., Kamundi, D.A., Manyama, P.A. 2009. Red List of South Africa plants 2009 . Strelitzia 25. South African National Biodiversity Institute, Pretoria. Watt, J.M. & Breyer-Brandwijk, M.G. 1963. The medicinal and poisonous plants of southern and eastern Africa , edn 2. Oliver & Boyd, London, Edinburgh.